We are excited to share some findings from our first Manufacturing Industry Output Tracker relating to manufacturing output, the sliding growth of machinery production, and the top performing sectors in industrial production. Our report found that manufacturing output (for the 34 regions covered) has risen nearly 75% over the last ten years to reach just over $35 trillion in 2017. This growth, unsurprisingly, can mainly be attributed to the explosive growth in China’s manufacturing sector. China is the only major country to have grown its manufacturing sector for the entirety of the last ten years. Back in 2007 China accounted for approximately 25% of manufacturing output but at the end of 2017 accounted for a staggering 48%. 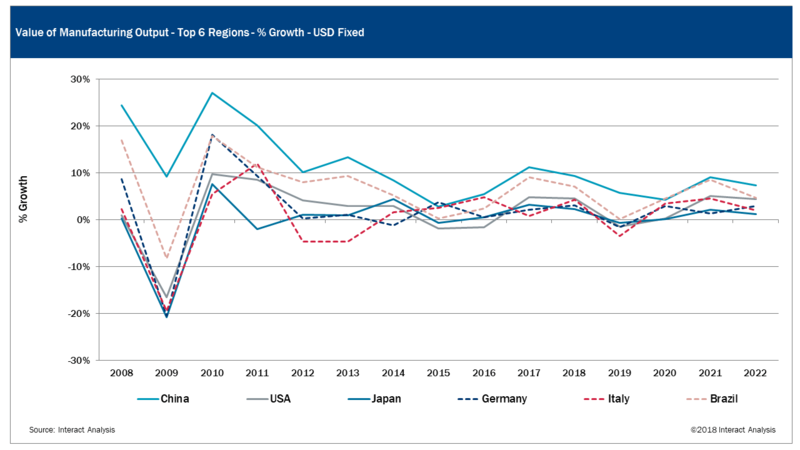 With nearly half of the value of manufacturing output housed in China alone, Asia has gained significant share over both Europe and the Americas since 2007 and we project this trend to continue. 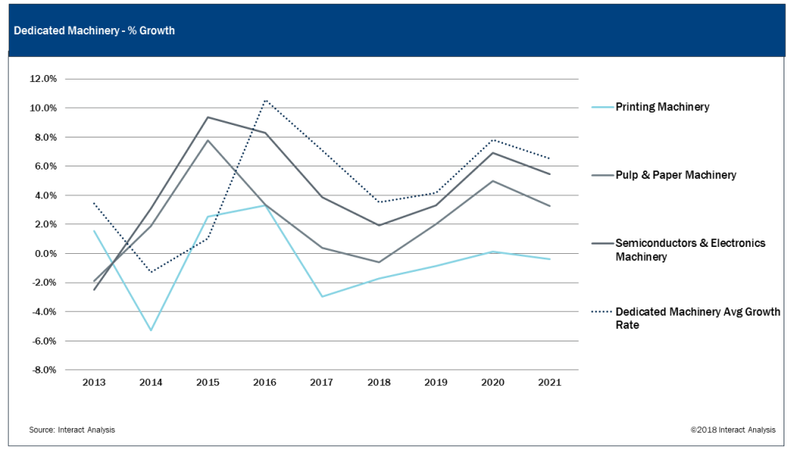 In the two figures below, you can see the growth rates for the top six major manufacturing countries and how that growth translates into total manufacturing output value for the three major regions. Within the MIO Tracker, the sizes of industry production and machinery production are clearly differentiated. Industry production is, in effect, the output from factories while machinery production refers to the equipment sold and used therein (for the most part). While machinery production makes up only 5% of the manufacturing industry, it is interesting to analyze the two separately. 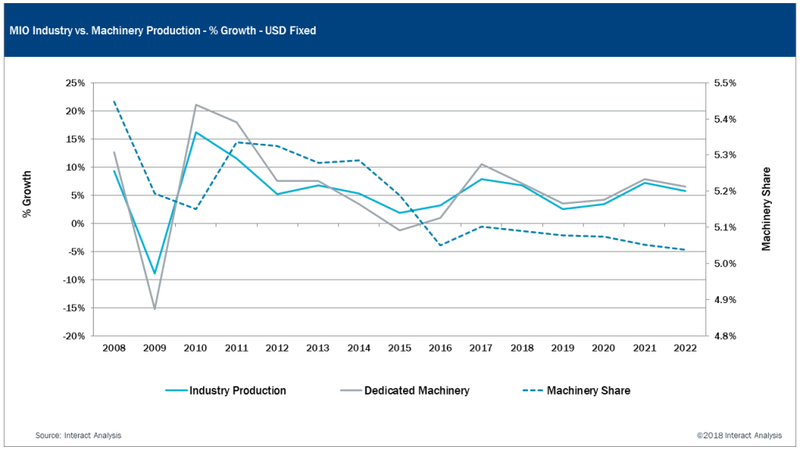 As you can see from the figure below, growth rates of industry production and machinery production are closely related. Logically, this makes sense. As demand for manufactured goods decreases, so does the demand for the machinery used to create these products. Conversely, an increase in the demand for manufactured goods yields investment into the machinery needed to meet that demand. An interesting trend to note is how machinery’s share of total manufacturing value declined during the period 2008 to 2016. 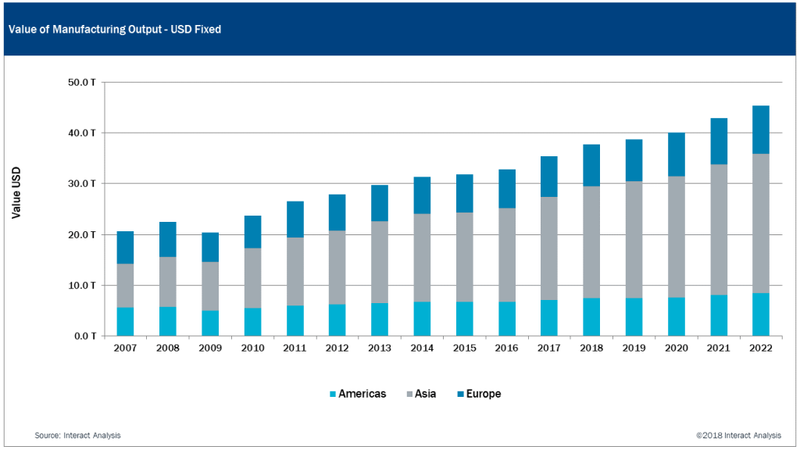 While the amount in percentage terms is small, this reduction in share potentially impacts machinery market revenues by in excess of $100 billion, so the trend is significant. Without volume information, it is difficult to infer exactly what is going on here. However, we suspect that unit volume of machinery is on the increase aligned with manufacturing output, suggesting that a reduction in pricing over time is impacting revenues and therefore share. What could cause such a reduction during the last 10 years? We suspect two main factors. First, machines in China, in general, cost less than their overseas counterparts. Thus, as China expands machinery production, and captures market share from other regions, the average price of all machines will fall. Second, as visualized below, certain machinery sectors have been experiencing below machinery average growth rates. The notable drop-off in machinery market share between 2015 and 2016 correlates with underperformances by pulp & paper, semiconductor & electronics and printing machinery. 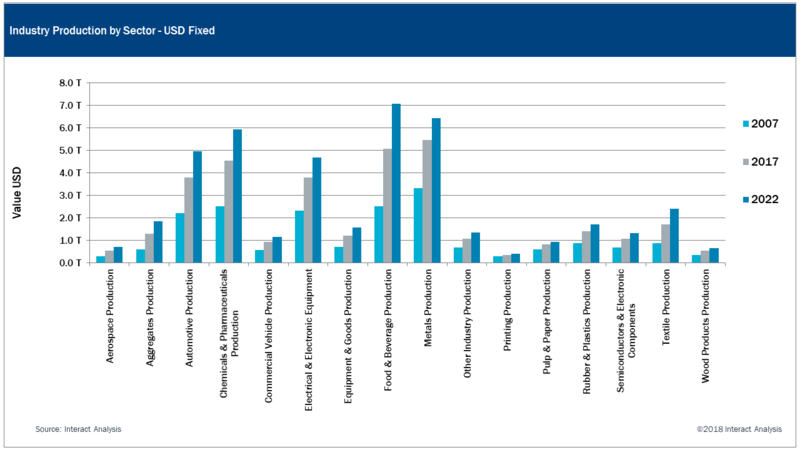 What is significant here is that these sectors are all high value machinery sectors, so when they underperform, the total average machinery price will reduce. Of the sixteen different industries analyzed, five industries dwarfed the others in 2017. Metals, food & beverages, chemicals & pharmaceuticals, automotive, and electrical & electronic equipment were each more than double the size of the sixth largest industry last year. The smallest industries as of 2017 were printing production and pulp & paper. There is a lot to be understood about the forces at play in the manufacturing industry. This summary only shows the very top level of data contained in the Manufacturing Industry Output Tracker. Even when just scratching the surface, the MIO Tracker provides the ability to develop a holistic view of global manufacturing trends in general. 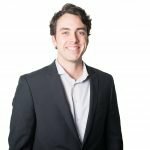 The real value of this dataset, however, lies in being able to query the data at a regional and industry level, making it possible to uncover advantageous trends in an incredibly large and complex industry. The MIO data is aggregated from 34 countries. Those countries selected contain most of the largest manufacturing regions globally; we tentatively estimate they account for more than 80% of total output. We have not made any effort to eliminate double counting, meaning the value of a component may have revenue attributed to it multiple times as it passes through the supply chain. To provide meaningful comparative analyses between countries, we converted (fixed) all local currencies to US dollars using average exchange rates relative to the USD over an 11-year period (2007-2017). This approach eliminates the impact of currency movement, which can distort like-for-like growth comparisons.